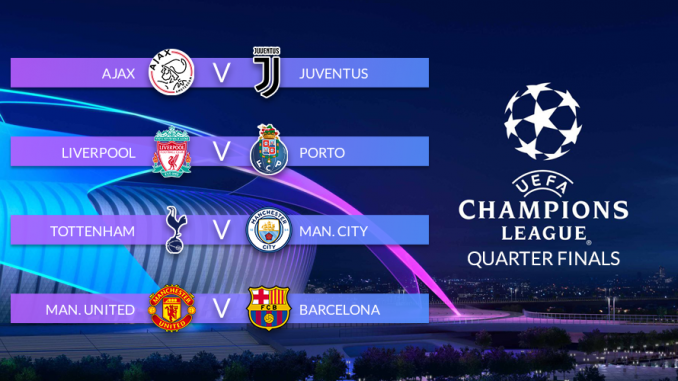 The quarter-finals of this year’s Champions League sees yet another wide open draw, after some big wins and big shocks in the round of 16. Nobody expected to see Real Madrid and PSG knocked out before this stage, as Ajax and Manchester United look to relive some former glory this season. Not forgetting the dominant performances elsewhere, from some of the remaining big names. With some of the early favourites now out of contention, a place in the semis is a possibility for any of the last 8 teams. So let’s look at who’s worth a flutter in this exciting draw. The beauty of the game, right? With all the excitement going on elsewhere, Spurs arguably haven’t gotten the attention they deserve for their convincing win over Dortmund. As the only team not to concede a goal in the last round, Spurs will surely be delighted with their performance (just like anyone who may have had a bet on that!) More impressive is the fact that they only had their star man, Harry Kane, for one of the legs in a tie they were by no means a sure thing to progress from. Standing in their way though is the side who racked up more goals in the last round than anyone could have expected. Manchester City shot 7 goals past Schalke in their home tie of the last 16, running away with a 10-2 win on aggregate. The hard-fought 3-2 win in the first leg raised some doubts as to their status as favourites for the tournament, but those fears were put to bed with the incredible second leg display. This win sends a message to other teams and must have City fans believing that the quadruple isn’t as ridiculous as first thought. Prediction? It’s hard to see past City in this tie. Pep and co. to advance to the semi-finals. For all the latest odds from Dafabet, click here. Speaking of multiple silverware, are we dismissing Liverpool’s chances of a double? They’re battling out for the top position domestically, and have arguably the least daunting draw at this stage of the Champions League. After a tight first leg against Bayern Munich, Klopp’s men put the nerves to bed in the second leg, winning 3-1 against a European powerhouse in their own back yard. After such a strong display, you’d almost forgive the Liverpool faithful for bringing up 2005 glory again. Almost. It took a 117th-minute winner to take Porto to this stage of the competition, as they edged past Roma in the tightest tie of the last round. While it’s hard to rule them out entirely, given their strong performances and the upsets elsewhere, you’d have to think they’re facing their toughest test in the competition so far against this Liverpool side. But stranger things have happened, and it’s not as if they haven’t done this before, right? Prediction? Liverpool are the favourites here, and rightfully so. Liverpool to take this tie, but not without some Portuguese interruptions. For all the latest odds from Unibet, click here. Our next tie sees the Dutch dark horses take on Italy’s Old Lady, a draw that sees two European stalwarts go head-to-head for a place in the semis. Ajax’s win over Real Madrid was the biggest shock of the last round as they overturned a 2-1 deficit in the Bernabeu to run away with a 5-3 aggregate victory. Although Real Madrid may not have been at their best, a terrific display from the Dutch frontline now put’s Ajax in real contention to advance even further in this competition. It’s safe to say they aren’t favourites in this quarter-final tie, but they weren’t last time out either. Ajax comes up against a strong Juventus side though, who must certainly feel like they can go all the way in this competition. In particular, one man stands in the way of Ajax’s progression, and that’s the one and only Cristiano Ronaldo. His performance against Athletico Madrid personified his big game mentality, and he will reveal at the chance to do it again. Not forgetting his teammates who have come close to European glory in the recent past, and will jump at the chance to lift the trophy this time around. Prediction? On paper, you’d have to think Juventus have this one sewn up, but you simply cannot rule out Ajax after the last round. I’ll go out on a whim and tip Ajax to edge this one. For all the latest odds from Coral, click here. Olés hype train looked like it was coming off the rails after losing their first leg at home to PSG, with their champions league hopes being dashed in a 7-minute spell in the second half. However, this proved to be just a pit-stop as De Gea, Lukaku and Rashford led United to victory in Paris, in another huge last 16 shock. The growing resurgence continues, with the win in Paris really cementing their new-found strength. Belief is high for Man United fans, but it’ll take another incredible performance to advance to the semi-final stage. Barcelona stand-in Manchester United’s way, as the only side who managed to win one of their games 5-1 and still advance without anyone batting an eyelid. Their straightforward advancement to this round puts them in real contention, yet still, some bookies don’t make them favourites. While this is a competition much more open than they’re used to, you can’t deny that they have to be considered to go all the way with Messi at the helm. Prediction? Barcelona should take this one and should be considered for a tipple on lifting the cup. Unless Scholesy comes out of retirement, of course. For all the latest odds from Betdaq, click here.